Hi!!! 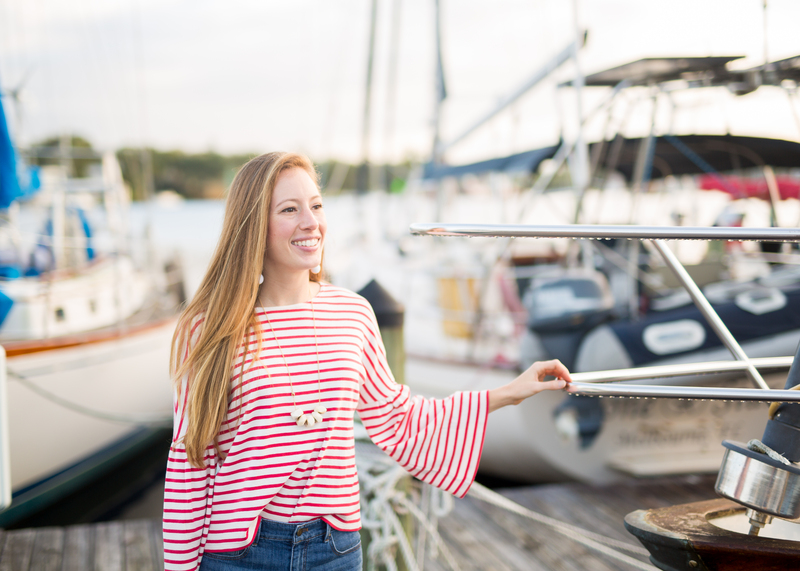 My names Katie and I was born and raised in Melbourne, Florida (about 30 minutes from Cocoa Beach!). Yes, I am one of those rare Florida natives. I loved growing up in the Sunshine State and spent half my childhood swimming in the ocean and any pool I could find, eating way to much ice cream and only changed out of my swimsuit when it was absolutely necessary. I’m kind of still the same way! Being born on the East Coast of Florida really influenced my classic and coastal style! I love bright colors, stripes, dresses, shorts, all things raffia and happy! On the weekends I love love love being outside and doing something active. Swimming in the ocean is my favorite but I also love paddle boarding, exploring new places and hammocking in my Eno. Besides fashion and adventure I love baking, working out at Trinity Fitness, and hanging with my friends and family. I really do love the simple things in life. When I was little, believe it or not, I was a super shy kid. I really struggled with self-confidence and found fashion as the perfect way to express my personality. Fashion has been a huge part of my life since I was little and brings me so much joy. Around high school and college, my family started calling me “Katie the fashionista” ha. I legit remember what I wore the first day of school from Kindergarten to Senior Year. I would plan that outfit out all summer. I truly believe my sunshine comes from the light of Jesus! Weather it’s raining or the sun is shining, I’m a firm believer that life is about choosing joy every day. I am 100% a glass half-full kind of girl who is always looking for the best in everything. Years ago an older man at a church I used to work at started calling me “sunshine” every time I would see him. The word always stuck with me because I felt like he saw something I never saw in myself and helped me truly believe it. Once I realized I was actually always full of joy and cheery, I knew I wanted to use it as part of my blog name. And the one thing I loved more than being happy and enjoying the outside sunshine was style! So I combined the two things I love to help you SHINE in STYLE! It’s always my hope that you leave with a bit more sunshine added to your day! She’s confident, adventurous and wants to look stylish everyday! She shops on a budget but is not afraid to take risks and splurge when necessary. She loves to try new trends and is constantly refining her personal style. While comfort is key, she is most concerned with looking and feeling her best. Most importantly, she seeks to find sunshine in the everyday and SHINE in STYLE! -Throughout High School I was a competitive All-Star Cheerleader for 4 years. I also cheered on my High School Varsity Cheer team for one short year. Please never ask me the difference between offense and defense because I still don’t know! – Avocados are amazing and I could eat them with a spoon for breakfast, lunch, and dinner. I own avocado shoes and their probably my most commented on item! – I am completely biased when I say that pugs are the cutest animals alive. I used to have one named Muffin and he was seriously the best dog ever! – A month before I started 7th grade I broke my arm doing a back handspring and had to wear a giant plaster cast to school that was so huge, none of my clothes would fit over it. – My BFF and I used to nickname all of our boy crushes in high school hilarious names and would refer to them all the time like we were close friends with them. We still laugh about it to this day. And we still refer to them by their nicknames. HA! If you want to send a quick shout out, have any questions or you want to collaborate, I’d love to hear from you! sunshinestyleblog AT hotmail DOT com. For the latest sunny and bright fashion follow me on Instagram, Facebook, and Pinterest!